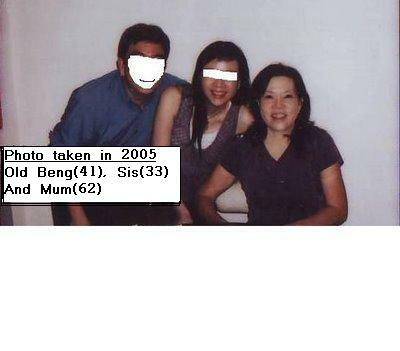 Before lim peh write anything, I like to show you an old photo which lim peh had posted before. aiyo.. like that how can recognize? your mama is so young! and she doesn't look her age too! wat did she do to to maintain looking so young??!!! My Sister is getting married! See her pretty pictures! old beng! im still reading your blog, though i havent been commenting =) i havent re-written a blog yet, if i do, i'll let you know =) Love your blog! Everyone in the family looks younger than their real age. Is it because of 遗传基因 or 保养有佳? ..eee, didn't know that your face is so 'White', and no nose one. Kam siah, everyone also says my mum looks very young. I really don't know her secret leh. If got chance, you can ask her personally. I can also say "Wise minds think alike"
Your sis very pretty hor. I think is 遗传基因 plus 保养有佳 but I am the only one who looks much older. your mum didn't aged..but you aged..
see hair all gray already! Ya lor, not gray somemore, WHITE!!! You are right, she does look young for her age. How come you always mask your face up? :) Like those old days chinese movie, where most of the sword man and assassin did. Masking is lim peh's trademark liao mah. old beng, ur mom look young than ur leh. said is ur sister better than mom lah. also can see ur cha-bo-lang in d photo. haha. Hmmm...funny leh, how can you compare my mum and I since I blanco-ed my humsup face unless of course you met me in person before. Sis is younger so better than my mum is correct. My cha-bo-lang did not even go for the dinner taht night so how can you see my cha-bo-lang in the photo? The last lady is my sister la.